You've been rejected from all consulting jobs. What's next? You’ve been rejected from all consulting jobs. What’s next? It’s an important question – and never more so than in today’s market. 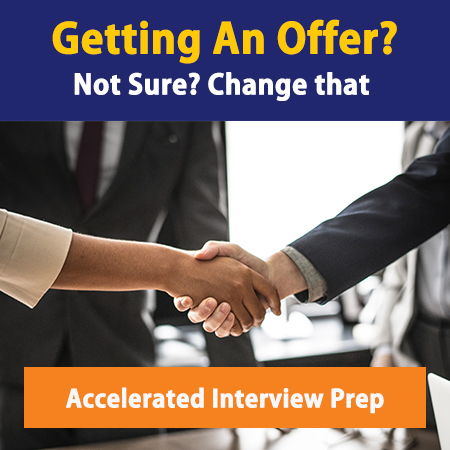 What’s next – when your resume doesn’t receive an interview; your first round doesn’t lead to a call-back; your final round receives a polite rejection? In this post, we’ll highlight the key steps to take when this happens. Not a fun post – but a necessary one. Once you’ve received feedback, take it to heart! Practice will only help for future interviews or next year’s recruiting cycle. If this isn’t your last interview, prepare doubly hard for the next one. No surprise here. Internalize feedback about your shortcomings (“you were unstructured in your approach to the case…you had an insufficient understanding of the underlying business drivers…we didn’t feel that you were a good fit for our company culture”). One of the most common mistakes people make is to practice alone. Do it with another person, and ideally an expert – it’s 5x more valuable. Ask your family as a last resort. Steve Shu is on the mark here when he suggests “casting a wide net”. Applicants suffer from tunnel vision – the whole “Bain or Bust mentality”. Apply to whatever is available and take interviews even if you wouldn’t accept the offer. Practice is key and options are valuable. There simply isn’t a consulting firms database comparable to what exists in investment banking. We’re in the midst of building one; until then – Vault has a good starting point here. As discussed previously, online consulting applications should be a last resort. Networking will be a key differentiator. Ultimately, you may still be rejected from the industry. But the game’s just started! There are plenty of other options – ones you should’ve considered from day 1 anyway. If your heart is still set on management and strategy consulting, the best thing you can do is recruit for jobs with the best combination of brand recognition and skill-development. Suggested areas include finance (eg, investment banking and sales & trading) and the corporate track (eg, corporate management and product management). Not a particularly innovative list – but you get our point. Consider grad school. Particularly if your undergraduate institution is not a “target school” – a top tier grad school can be a solid reset button. Masters programs are shorter and less selective than other alternatives. Important disclaimer – don’t get a masters degree just for recruiting purposes. Finally, there’s entrepreneurship. We’re clearly a big fan, but startups won’t allow you to break back into consulting unless you consider post-graduate education. There’s no clear network and no channel into management consulting. It is a viable path, however, to venture capital. Never stop networking. It makes a difference, particularly in tough economic times when there are 10 equally qualified candidates for 2 positions. It comes down to who you know and how well. If you’re in school, network at information sessions, social mixers, business conferences. If you’re out of school, network through school alumni, colleagues past and present, family and friends. Online media (in particular, blogging and forum discussions) can be another great way to meet people with overlapping interests. Need help developing a networking game plan? This particularly applies to summer internship applicants. Driving factors for resume rejection include low GPA, lack of leadership experiences and initiative taking, and lack of strong work experience. Work on them however you can. Interview rejection can include factors above, plus lack of preparation. Don’t slack off. Many complaints that people have about their current jobs are fixable – insufficient responsibility, lack of challenging work, no upward movement. The solution to these topics belongs on another blog, but my advice is to take initiative wherever possible. This applies for current students as well. Your track record of promotions, driving impact, skills learned – will be critical when you try to land consulting jobs! Not sure what happened – need to bounce your ideas and approach of someone else with expertise in the area of breaking into management consulting? Our team of coaches (who have worked for big firms like Bain, McKinsey, and BCG) will be happy to help you out. Book now for a Power Half Hour where we’ll give you honest, real critiques about your process – where you could improve and what you could do differently.